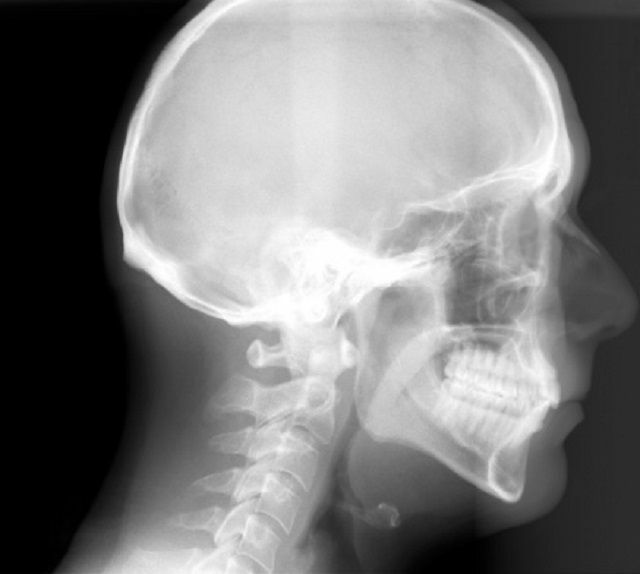 A cephalometric x-ray, which is also sometimes referred to simply as a ceph, is a diagnostic radiograph used primarily for orthodontic treatment planning. A cephalometric x-ray is taken during the orthodontic records appointment. Cephalometric x-rays are also used by otolaryngologists — doctors who specialize in the treatment of ear, nose, and throat (ENT) disorders such as sleep apnea — because these x-rays provide a view of the patient's airways. The process of undergoing a cephalometric x-ray is pretty straightforward. Concentrating on the patient's profile — or side view of the head — the x-ray technician positions the patient according to specific criteria necessary when taking a cephalometric x-ray. The exposure takes approximately 10 seconds and the x-ray is developed in approximately five to six minutes. Most dental offices are equipped with the equipment necessary to take a cephalometric x-ray. Once developed, the dentist will use tracing paper, and "trace the ceph" in order to calculate how the patient's jaw and surrounding bone will be affected by orthodontic treatment, along with providing the dentist with a look into the growth pattern of the jaw and teeth. This can be used to determine potential courses of action and routes of treatment. Cephalometric x-rays may be taken intermediately throughout orthodontic treatment, although most orthodontists will only take a preliminary ceph, then a final ceph when treatment is completed. Occasionally, they will decide to take a ceph in the middle of orthodontic treatment to monitor progress. Having a cephalometric x-ray taken is very similar to having a panorex x-ray taken. A panorex x-ray is a two-dimensional x-ray used in the dental field. It displays both jaws, the upper and lower, as well as the teeth, at the same time. Panorex films have several uses. They are used regularly for orthodontic assessments, diagnosis of wisdom teeth impaction, diagnosis of advanced periodontal disease, assessment of the jaw joint, as well as for detecting signs of oral cancer. During a panorex x-ray, the patient is asked to bite directly down on a specialized tool that works to assist the operator in positioning the head of the patient in the right position. The patient is also asked to remain extremely still during the x-ray. Once the x-ray is taken, it is displayed digitally on a computer monitor, or it is processed onto regular x-ray film, which is the traditional approach. Also Known As: A cephalometric x-ray is also commonly referred to as simply a ceph.